King Shibi Rana was a kind and generous king who was famous for his truthfulness. One day, the Gods decided to test king Rana's truthfulness. So they got themselves converted to an eagle and a dove. The eagle started chasing the dove. King Rana was praying to God at that time. The dove settled in the laps of King Shibi and said, "Dear king, please save my life from that eagle". The king promised to save the dove's life. But the eagle saw this and he said, "O king that is my food. Please give that to me. I am very hungry." 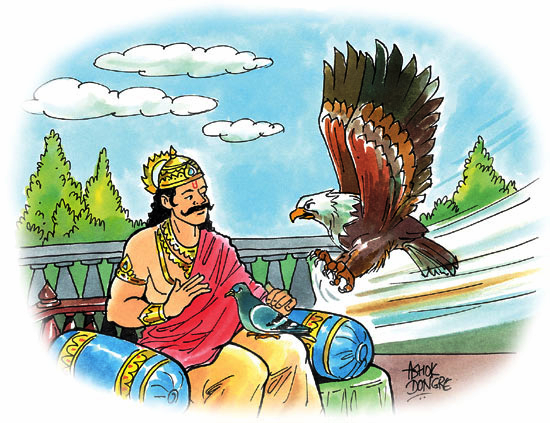 King Shibi wanted to protect the dove, who had taken shelter in him. At the same time he didn't want to deprive the eagle of his food. So he make an offer to the eagle. He said that he would give the same amount of meat in return. The eagle demanded flesh from the right thigh of the king on a condition that the king should not drop a tear when his thigh was cut. King Shibi agreed for the demand. The dove was kept on one side of a balance and a small amount of flesh from the king's right thigh on the other. Surprisingly, that didn't match to the dove's weight. So they cut more flesh from the king's thigh and added to the balance. No matter how much flesh was added, the dove was always heavier. At last the king himself sat on that side of the balance. Now the two Gods were pleased with the sacrifice of King Shibi. They appeared in front of him and blessed him with good health and wealth to rule the country.